This almost art house DVD is a captivating tale about 15-year old Billy Price, an intelligent yet extroverted teenager who at the age of 5 almost became institutionalized. Jennifer Venditti directs this documentary about a boy with dreams and how his family support their son 100%. With a love for movies, Billy awkwardly moves through school with his strange characteristics, yet quite likeable presence with his strange quirks. 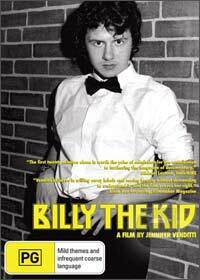 Ironically after the filming of the movie, Billy was diagnosed with Asperger syndrome which the extras gives another insight into the teenager Billy and director Jennifer Venditti. Video wise, the quality is a lacking, however the story more than makes up for the video and audio inadequacies. Featuring drama, romance and at times comedy, Billy the Kid is truly an inspirational DVD!